A superb way to get inmerse in Madrid and surroundings starting with a 2.5 hour morning sightseeing tour by bus of the city, to discover the most important buildings, avenues and squares of Madrid. 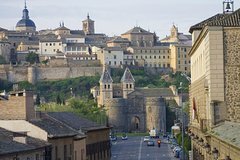 On the afternoon we include a half day tour to Toledo, unique city in the world where the 3 most important western cultures lived in peace for centuries, visiting the most impressive places with a professional guide. The day will end with an assistance to one of the most famous flamenco shows in Madrid, where you will feel the roots of this ancestral dance having a drink. These 3 tours must be taken the same day. Maximum participants is 15. At 09.00 h, hop on and enjoy the great sights of Madrid by bus. During the tour there will be stops at places such as the Gran Via, Plaza de España, the university, Moncloa, Calle Major, Puerta del Sol, Puerta de Alcalá, the bullring, Columbus square followed by a brief stop at the Madrid Hard Rock Cafe for a complimentary soft drink. At 15.00 h. your tour to Toledo by air conditioned bus will begin. Upon arrival you'll start with a panoramic walking tour of Toledo, entering to the old quarters to visit the Plaza del Ayuntamiento, and admire the facade of the impressive Primate Cathedral, the old Palace of Justice and the City Hall. Continue your walk through the old Jewish quarter with its narrow streets to visit the Church of St. Tomé, with the very famous painting of El Greco “The Burial of Count Orgaz”,and the old Synagogue of Ste. Maria la Blanca, which remains as a symbol of the coexistence of the “Three Cultures”. At the designated time, go by your own to the Tablao Flamenco Torres Bermejas, opened in 1960, the most important and unique in the world flamenco show. Torres Bermejas is unique for its stunning room that reproduces inside the Bermejas towers of the Alhambra in Granada with walls with Arabic motifs, tiles and wooden coffered ceilings, and home of the most famous Flamenco singers and dancers as Manolo Caracol, Camarón, etc, where you will feel a real ambience and see a magnificient show of Flamenco songs and dances, including a drink. Return back to the hotel not included.